Bar Hebraeus (1226-1286) is one the best known Syriac writers of the Middle Ages. His Chronography contains a history of the world from creation until his own time. Most of his information relates to events in the Middle East, including accounts of many of the crusades. 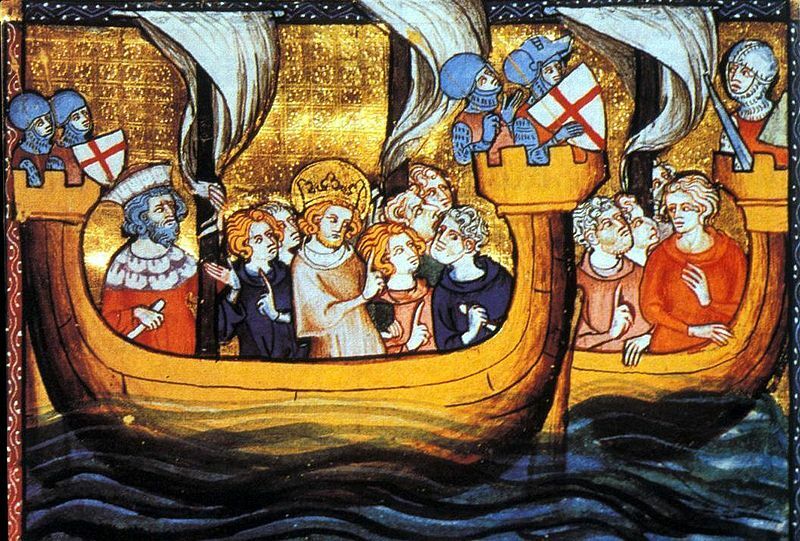 In the following section, Bar Hebraeus details the Seventh Crusade, where Louis IX, king of France, led an expedition which captured the Egyptian city of Damietta, but then was defeated and captured. There are several other accounts of this crusade, including the Memoirs of the Lord of Joinville, a letter from a knight named Guy, and an Arabic account. And after these things, that is in the year fifteen hundred and sixty-one of the Greeks (AD 1250), Ridafrans [Roi de France, namely Louis IX], one of the kings of the inner [remote] countries of the Franks, went forth with a mighty collection of people, horsemen, and footmen, and soldiers, and mighty men of war, and they sailed on the sea in great ships and in vessels which were filled with an endless amount of gold and silver, and weapons of war, and provisions. And the earth quaked at the sound of them, and it was reported that they were prepared to go forth to Egypt. Now Malik al-Salih, the son of Kamil, the lord of Egypt, who, because, his younger brother Adil died, had suceeded him [as lord] over Emesa, a city in Palestine, was fighting in order to take it from Malik ‘Ashraf, its lord, who was descended from Asad ad-Din Shirkuh, the uncle of Saladin the Great, and subsequently Tell Bashir was his. The Salih, hearing the report of the Franks, left Emesa, and with swift marches came to Egypt. And he went and encamped at the place called Mansurah, where there are dense plantations of trees. And he threw down the word [commanded] in the Arabic language, and there gathered together to him large crowds of Arabs from Alexandria, and from Kus and from Aswan. And when the people of the city of Damietta saw the gaze of the Franks was directed to them, terror fell upon them. And without the tribulation or war they emptied the city of everything which was in it, and they took their families and all their possessions and went to Egypt. And the nobles of Damietta went to the Sultan, and Malik Salih asked them ‘if the Franks had harassed them with war.’ And they replied , ‘No, but we are afraid lest that which happened once in Akko may happen to us; the Franks killed them [the men of Akko] , and no man pleased them.’ And Salih was exceedingly angry with them, and he hung up sixty-four famous nobles on thirty-two crosses [or stakes], two to every cross, just as they were, with their apparel on their bodies and their sandals on their feet. And when he had crucified these men, he himself died a few days later through a virulent ulcer which had broken out in his thigh; and it was cut out from him just as it was and fell down. And the Egyptian nobles sent and brought Malik Mu’atam, the son of Salih, who was then in the citadel of Kipa, and they made him king in place of his father. And his administrator was Fakr ad-Din ‘Uthman, the son of the Shaikh Ash-Shyukh, the great vizier. Then the Franks drew near to the walls of Damietta, and they did not hear the voice of the guards, neither did they see any man in the towers, and they marveled. And they also sent men who went inside the harbour, and they never met a single person. And then they knew of a certainty that [the people] had fled, and they drew near and went into the city with great content and gladness. And that day was the sixth day of the week, and they did not find any man urinating by the wall; and the ships were supplying them with food of all kinds from the sea. And Mu’atam inclined to their advice, and he had the king of France brought to him by night, and he made him to take the oath according to what he wished. And he gave him many gifts and dismissed him. It is said that during the days in which the king of France was a prisoner, the report reached him that the queen his wife in Damietta had borne him a son. And Mu’atam heard of it, and he sent to her gifts, namely ten thousand red dinars and a golden cradle, together with royal raiment. Now as soon as the old slaves of Mu’atam’s father perceived that he had dismissed the king of France, they were filled with rage, and they sent ships out to sea to seize him. And when they could not overtake him, they drew their swords and attacked Mu’atam. He fled before them and went up into a wooden tower which he had. And they set fire to the tower. And when he saw himself in the middle of the fire he case himself into the sea and was drowned, and his body was never found. This text is from The Chronography of Gregory Abu’l Faraj…Bar Hebraeus, trans. Ernest A. Wallis Budge (London, 1932). This entry was posted in Primary Sources and tagged 13C, Crusades, Egypt, Seventh Crusade. Bookmark the permalink.